The meeting of the Nicaraguan Bishops, responsible for carrying out the National Dialogue, which took place July 23, 2018, was very demanding and at the end, no press release was issued, according to Fides News Agency. It was reiterated during the last participation of the individual members of the Episcopal Conference, that despite the increasingly difficult situation, Dialogue must continue because it is the only democratic way to live in peace in the country. While the attacks against churches and parishes in different areas have not stopped, the Catholic Church continues the campaign of prayer and is present in popular demonstrations organized to denounce the killing of young people in recent days. According to local information gathered by Agenzia Fides, the Bishops will meet a second time this week to evaluate the possibility of continuing to be mediators in the National Dialogue, but the meeting will analyze above all the terrible situation of tension. The international press strongly criticizes the government for the amount of false news that it wants to impose but is denied by the same population through social networks. 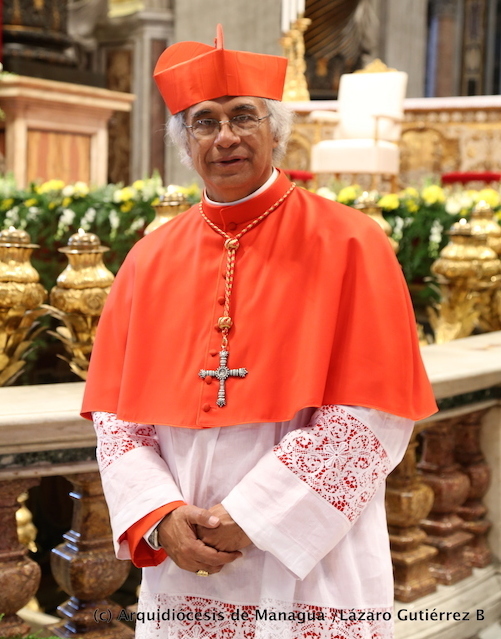 On Sunday, July 22, Cardinal Leopoldo Brenes, Archbishop of Managua, presided over Mass in the church of the Divine Mercy, the church attacked by paramilitaries where two young people died, for the act of reparation after desecration. The large crowd of believers who were present saw the Cardinal lift up his pectoral cross saying: “this is our only weapon”, then regarding the government’s accusations to the Bishops he said: “It is all false”. He then recalled that he himself, at the beginning of the crisis, had ordered priests to open churches to young people, “so that they can become field hospitals as Pope Francis asked”. Also Mgr. Báez, Auxiliary Bishop of Managua, sent twitter messages to Fides: “the Catholic Church of Nicaragua suffers the pain of the people and will always remain at her side because Jesus was always close to those who suffered most”. The Bishop presided over the Sunday celebration in the parish of San Miguel Arcangelo in Managua, and in his homily, he told the community: “as Pastors, we went to places where young people were attacked, because this is what a pastor does, he does not abandon his people”. Then he denounced: “It is not true that Bishops have political interests if we open churches to the young who are wounded it is because churches are shelters of charity for all”. Through social media, the individual Bishops have announced that the government has not yet decided to resume the sessions of National Dialogue, but they are always considered Mediators because no one has communicated otherwise. According to the international press, the government has not yet responded to the request to stop the repression against the young protesters and against the checkpoints in all the cities of the country. While at the proposal of early elections, Ortega himself said that there will be no elections. Despite this climate, on Monday, July 23, in memory of the students killed at the time of Somoza on this date, marches were held in different cities of Nicaragua. The increasingly numerous demonstrations against the government tend to show the media that these people are not only young people but whole families, peasants, workers, entrepreneurs and many ordinary people. The comment of the people participating in the march was: “If we lose the right path, we will become like Venezuela, and we do not want it”.